It’s a grey overcast cold day in Salt Lake City — and nobody cares. Because inside the Salt Palace it’s hot as RootsTech 2017 is in full swing. Today, the exhibit hall opens, there are sessions from early morning through an evening social and thousands upon thousands of genealogists are packing into the venerable convention center for the event. By the end of the day Saturday, the numbers are expected to be well in excess of 30,000 attendees. None of which makes you feel any better at all. Because you’re stuck at home. Worse, you saw the livestreaming schedule earlier in the week, and you can’t tune in because of things like work or doctor’s appointments or any of the myriad other little details of life that interfere with genealogy. The sessions that are being streamed are also being recorded. In fact, only a few of the streamed sessions are real-time. The keynotes, yes, and some of the other sessions. But many others are being recorded at one time and streamed at another. And the recorded sessions, all of them, will be available on the RootsTech site after the conference for those who couldn’t attend and couldn’t tune in during the real-time streaming. 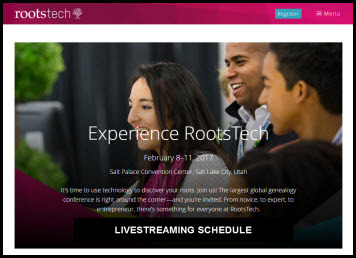 Just head over to the RootsTech home page to check out what’s available, either live or recorded, and join in the fun from Salt Lake City. The full schedule is online here, and you can read more about any of these sessions online here (just click on the day and then the session for a more complete description). If you can’t be there in person, streaming is the next best thing… and if you can’t be there in real-time, watching a recording is a pretty good option as well. I had forgotten that they are recorded as well! YAY, I won’t have to try to finagle at work to see your presentation tomorrow! I looked for the schedule and only found the keynote speakers. Very disappointed because I enjoyed watching the livestream presentations last year. I guess I didn’t look far enough- thanks for setting me straight. Very glad I didn’t miss the first livestreamed presentation this morning! I learned some things I hadn’t thought of. She’s right: this is a live-long deal, and we never stop learning. You broke the internet, ma’am. Glad the presentations are recorded so I can try again later. Your presentation on “Mothers, Daughters and Wives: tracing Female Lines” was great. I especially appreciated your explanation of the influence of English, Dutch, French and Spanish law on the family law of different US regions originally colonized by settlers from each of those countries, but it might also be worth a passing mention that the law of England has a number of differences from the law of Scotland. I’ve been told that the Scottish legal system placed much more importance on female lines of descent than the English legal system did, and that this explains why the maiden names of my female relatives who came to the US from Scotland so often appear on the birth, death and marriage records of their US-born children, as well as in their own obituaries and estate records. The Scottish system does draw from civil law, yes. Yes, the Auld Alliance between Scotland and France was important in the transfer of ideas. But, the civil law on the Continent at the time was Roman law, not the more modern Napoleonic Code, and Scottish law also draws from the customs of the ancient Gaelic, Norse and Anglo-Saxon populations (not to mention the mysterious Picts, who left no written records behind for us to analyze). It’s a subject I really wish I knew more about.